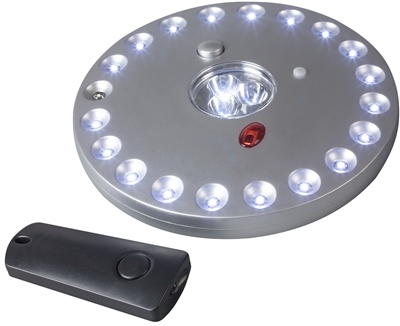 This unique lighting device offers all the same great features as the standard brilliant tent light, but with a unique remote control. This unique Tent Light offers three different light settings as well as a wall mount, hanging/stand feature and an ultra strong magnet for securing onto metal. One click of the On button will activate the three centre LED’s only, a second click will activate the outer 20 LED’s only, and a third click will activate all 23 super bright LED bulbs. The Dazzle Tent Lights remote control comes with a handy keyring/cord section, this allows the remote to be attach to a belt or keys ensuring it never gets lost. Kampa have provided their Dazzle Tent Light with ultra low power consumption bulbs, this means you will never have to replace a single LED. Read below for this Dazzle Tent Lights full specification. So much better than fiddling round with torches, and you can turn the lights off from the comfort of your sleeping bag! Has a loop so you can hang from a hook, also has a magnet to attach to your tent lining so you can hang it wherever you want! Yet to see how long the batteries will last though! bought two of the dazzle lights , one for outside of the tent and the other for inside , absolutely brilliant dont be fooled by the size [they are small] they give of fab lighting x the remote is so good , had it by the side of the camp bed for when you need a wee in the night . 10 out of 10 kampa . used it for 2 weeks on the same set of bateries...hung it from the top of the tent and from tree branches to eat at night. lit very well to tables put together...excellent product...remote control great for things that go bump in the night and you need to light immediately.